Join us for a community celebration of three permanent art installations in the museum courtyard. The new pieces include two large-scale, hammered copper sculptures by Walla Walla, Wash., artist Wayne Chabre, as well as a Western red cedar table and benches handcrafted by local artist Tim Boyden. Donated by the Soreng family, the works reflect the museum’s longstanding commitment to enhancing public spaces with works by Pacific Northwest artists. 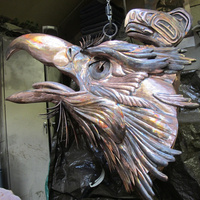 The copper sculptures – one depicting a wolf, the other an eagle – embody character traits important to native Pacific Northwest cultures and complement the museum’s traditional Northwest Coast longhouse-inspired architecture. The sculptures will be mounted on the museum’s north- and south-facing porticoes, respectively. The wolf and eagle join three other Chabre works already adorning the museum’s exterior, including a raven, bear, and the iconic salmon at the building entrance. The table and benches, situated in a shady corner of the courtyard, are dedicated to the memory of Eugene philanthropist John Soreng, and to his conservation efforts in Oregon. During the celebration, Jon Erlandson, the museum’s executive director, will give a brief address, and UO Many Nations Longhouse steward Gordon Bettles will share traditional stories about the wolf and eagle as part of a blessing ceremony.